The above info came from Hamstarzchan, and was edited by yours truly (contact me). 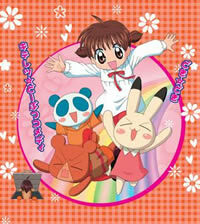 Ami-chan is a young, 5 year old girl who moves into a new house with her parents. While there, Ami-chan discovers something truly amazing: little animals who can walk and talk are also in her new house. They are Issa the innocent panda, Kenta a bear who is always putting on the tough-guy act and Iyo, a white rabbit who spends her time enjoying the happiness and safety of her friends. These three curious animal friends all come from Animal Yokocho (Lane) which may be accessed through an underground portal hidden in Ami-chan's bedroom. Together, these friends spend time together in Animal Yokocho whenever Ami-chan has some free time. Often they play seemingly innocent games, but in Animal Yokocho style. Unfortunately, this style is always completely different, illogical and usually much more dangerous. The above description came from Hamstarzchan, and was edited by yours truly (contact me).